I bought this basket of succulents at the grocery store and they are beautiful. I have yellow, orange and red flowers. The flowers are amazing. What are they, and how can I care for them? Surroundx, would you like to post your link here? Helping other people identify succulents is one of my favorite aspects. But I don't know every species/variety/cultivar. I have 6 videos of unidentified succulents of my own on YouTube. What a fabulous name - that describes this gorgeous plant exactly! Thanks again, Surroundx - any time you want a job, just come back here and identify all the lost succulents! 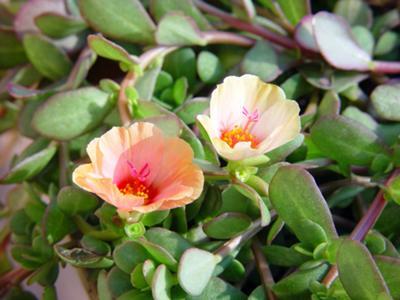 It is Portulaca 'Sun Jewels'. Thanks, Janie. I'll have to look out for these, as they are gorgeous. That is definitely portulaca. I have some on my front porch and they're just lovely! I'm not sure, but these almost look like Portulaca, which has flowers similar to these, in a cup shape and in many different colours. From the picture, these are a bit bigger than the common annual type, but there are other ones that get bigger and are perennial. Hope you can keep these growing and flowering the way they are - they're beautiful!